Did you know just a few percent difference in returns will make or break your retirement? Read on to see just how important this is and what you can do to grow your retirement faster. Clearly the investment landscape has changed in the past 15 years. 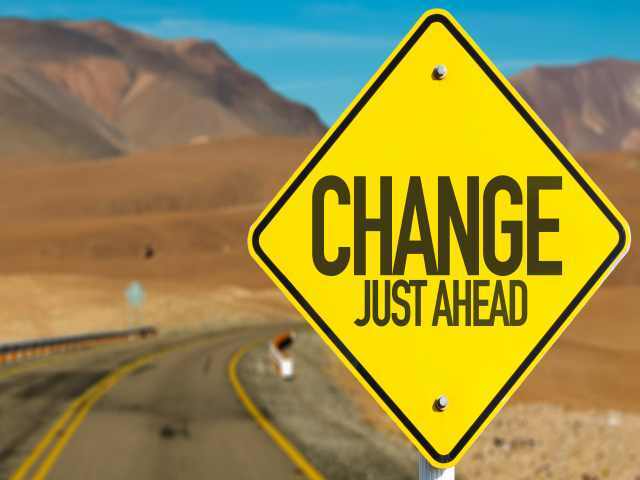 And it’s well known that not adapting to change means you’ll be left behind. Wall Street is struggling to keep up with inflation and investors are leaving in droves. Smart investors are moving into alternative investments, such as Cash-Flow Real Estate and Private Free Market assets. These offer higher returns than Wall Street without the roller coaster ride of stock market volatility. In Part 1 we started a case study of two fictitious investors, James and Mike. Let’s take a closer look at how they are doing. 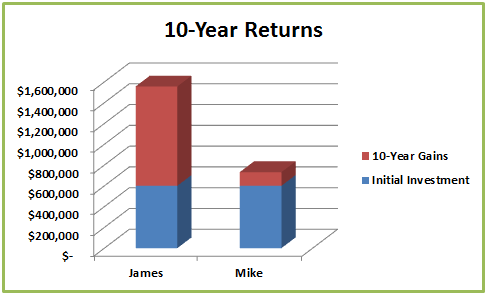 We compared James’ annual rate of return in cash-flow real estate and private free market assets of 10% (which is conservative) to Mike’s rate of return of 2% in the stock market (which may be generous). After 10 years, James has over double what Mike has. They both started with $600,000, but the difference in returns has made a huge difference. James’ portfolio has grown to $1,556,245 while Mike’s has barely grown to only $731,397. This is the power of compounding in action. If you need to catch up on your retirement, looking for higher returns (without gambling on risky investments) will help you reach your goals faster. Now let’s look at the difference after 25 years. With the same $600,000 initial investment James has left Mike in the dust. James now has $6,500,824 while Mike is left with $984,364. Both started with the same amount, but James chose to get out of his comfort zone and explore better options – and it paid off. James didn’t settle for second best. He found what’s working and put it into action. And after 25 years, James has over 6 times what Mike saved. Who do you think will have less stress and more peace of mind? A few percent difference in returns adds up over time. 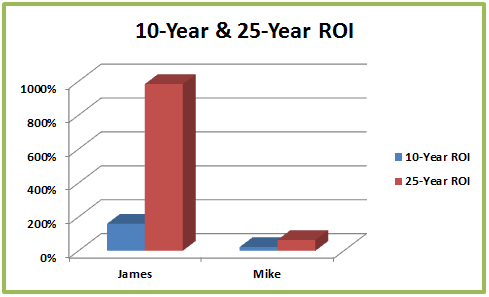 The next chart shows the total return on investment (ROI) for James and Mike over periods of 10 and 25 years. Because of the effect of compounding returns, James’ portfolio has a huge total return of 983% over 25 years. Mike’s only came out at 64% for the same period. 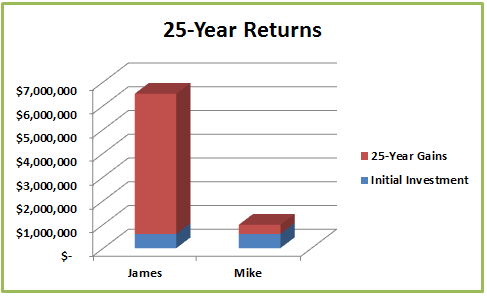 In fact, James’ higher rate of return had better results at 10 years than Mike’s did at 25 years. By over 50%. You can see that getting the best returns (while minimizing risk) means the difference that can make or break your retirement. So when recent Wall Street returns don’t look so great, you owe it to yourself to do something about it. Don’t just ride out poor returns hoping that some miracle will fix your retirement. One difference between James and Mike was that James set a concrete goal. Mike just hoped for the best. How you think about the future can make or break your retirement. James had a reason for his goal. He wanted to spend more time with his grandchildren and his retirement goal let him do that. Having a specific goal led James to look at where his investments were taking him. He knew he needed to make a change, so he found the right vehicle to get him to his goal. Not only did James reach his goal, but the higher rate of return he got let him retire earlier than he originally expected. Now he enjoys more time with his grand kids and has peace of mind knowing that he doesn’t have to worry about his financial future. Mike didn’t set a specific goal, so his future was wherever “chance” took him. The reality is that Mike could have done better, but he gave up and just did the same thing he always did. And that was a costly mistake. 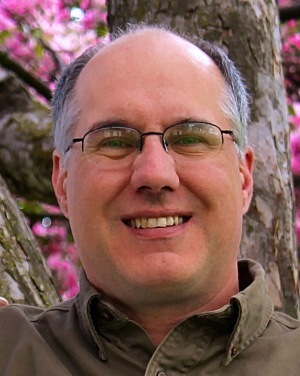 Mike hoped to retire by age 60, but he found that his retirement savings would not provide the lifestyle he wanted for himself and his family. And even worse, Mike worried about running out of savings in his golden years. So Mike gave up and decided he would have to keep working. For how long, he really didn’t know. Mike was stressed about his future. He wondered if he and his family would ever get to do the things they wanted, like traveling and seeing other parts of the world. Mike also worried about another stock market crash. That uncertainty was the biggest stress of all. James’ and Mike’s story shows us that you do have a choice. You don’t have to live with the worry of not meeting your financial goals or running out of money during retirement. Take a look at how you can move some of your retirement funds into alternative investments and grow your wealth quickly and safely. Start here as you take a look at how you can Invest Smarter With Alternative Investments.